My baby is a school girl now. Excuse me, when did this happen? The night before we lay out her clothes, pack her lunch and fill up her bag with all the essentials to get her through the next day. Two days a week we do this. In the morning we wake her up early and just like that she goes to preschool from 9-1. Sounds pretty small to most, but to us this was a riveting milestone. This is the first time she has ever been with anyone but family. For me, it is one of those slow releases people tell you about. It is a like teeter totter between doing what's best for her growth and wanting to keep her a baby forever. Of course, the first week she didn't even make it until one and I was a nervous wreck. The second week, she cried less. But by the third week she is having a blast!! I can already see how much she is learning and growing. She talks non stop now! She dances and sings more than ever. She is making new friends and bonding with her teachers. I could not be more happy! She still cries everyday when I drop her at the door, but it subsides much more quickly with each new day and I know she has fun. It is just so weird to think of her having a whole day of new experiences without any of us there. She is her own person now. Pretty soon, we will be packing her up for college. "Isn't it hard on you that your husband is gone all the time?" or the "How do you handle being home alone so often while he is out on the road? ", coupled with a face of either disapproval, concern, or sympathy. I get this at least once a week. I married a musician who stuck with his dream and faithfully turned a childhood hobby into a lifelong profession. With that comes a lot of uncharted and unfamiliar territory for the naive girl by his side. This means our schedules are totally opposite, and he is usually on the road anywhere from 3-5 days a week. When he's gone I get a good morning text, an afternoon call, and finally the most important call sometime between 1-3 am. (Are you coveting me yet?) Sometimes on really good days we IM or text randomly throughout while he is riding in the van to his next destination. (Glamorous, huh?) Another perk of being the wife of a driven musician is the ever so popular job of being the only parent to our little one for days at a time. There is no, "You wait until your father gets home. ", because I know it could be awhile. I get the weekend chores to do alone; along with the worries of the presumptuous girls who consider themselves "with the band". You may or may not be making your own judgements as you read this; but in my mind there is a hint of a silver lining. I am privileged to stand beside a man who didn't settle. I have been there with him when he literally had nothing, and I heard his protests when so many told him he couldn't. I've been there with him when he tried the 9-5. I saw his face when he came home stripped of his joy every single day of that long year. I've seen him stand firm in his choices, and be more deliberate about his life than many people our age. In a world where so many allow their job to pick them, or simply surrender themselves to a "successful" career; I feel sad. I especially feel sad for men who are doing something for which they were never made, and it shows on their face. Those men find Chris often. They approach him at church, at a bar, or in a group of friends. They each share their stories with a look of defeat in their eyes about how they always wanted to pursue a God given passion but-for one reason or another-they gave up. They tell him about the breaking point somewhere along the line when they got scared of failure or listened to someone telling them they couldn't. I was drawn to his passion from the beginning. I respect the drive he has for something he loves. He stuck true to a calling that runs deep in his veins, never wavering by the judgement of others. He is doing exactly what he was made to do, and for that I could never be more proud. Loving...I learned this from my Nannie. She loves unconditionally without a single request in return. Her voice drips of love when she speaks, never a harsh word thrown in your direction. She greets you with a hug and when her soft hands pat you so gently you instantly feel at ease. She loves purely, and I hope someday people say that about me. Serving...I learned this from my Dale. He is an expert at this. From taking me bowling and letting me jam out to Ace of Base in his car as a little girl; to two hour math tutoring sessions every single night when I was in high school; to driving hours in the snow when I was in college just to bring me home for my first birthday away from home. He served us completely, with no ulterior motive, just to show us his love. He serves completely, and I hope one day people can say that about me. Sacrifice...I learned this from my Mom. She never puts herself first. She meets the needs of others and runs to the rescue with no excuses. Growing up we had everything, while she often went without. When she hears of a need about someone she may not even really know; she gives her time, money and talents in an attempt to give them just a moments relief. Her actions speak louder than words. She sacrifices selflessly, and I hope someday people can say that about me. Y'all, I've been busy....and thus, you're still looking at my post from 1952-- those of you who haven't given up on me. Life has been a little crazy around our house, and I just started thinking the other day how much I missed my blogging. Writing is something I really love and also I want to keep writing for Gracie as well. I want her to be able to look back and read the thoughts of her crazy mama. I want her to know all the things I may forget to tell her later. So take a deep breath ladies and gentlemen...I'm back in the game. *** Disclaimer: If you think sororities are dumb, or if you have ever thought of us as people who pay for our friends, just go on ahead and click on another link. I won't be mad. If you are anyone else, allow me to explain. This weekend I have been feeling very sorry for myself nostalgic. I miss my friends. By friends I mean the ones who lived with me in Small Town, Oklahoma in a dorm hall with a red door and an owl painted on the sidewalk. The girls who I shared everything with, including the two Greek letters on the front of all of my t-shirts. Last night, I made the mistake of looking at my college website (who does that anyway) and then from there I curiously navigated to the home page of the Phi Theta chapter of Chi Omega. I began to glance through dozen of pictures. Pictures from rush, formals, date parties, football games, Homecoming, etc. As I clicked away, my heart ached a little bit. It seemed as if something was missing in each picture I saw. The events and the backgrounds were all the same, but the faces were all different. New girls had taken the places of where my best friends and I once stood with the same smiling faces. It just hit me like a ton of bricks, I miss them. My favorite memories are from the everyday. Those were the good old days, and I didn't even know it. I am who I am today because of the time I spent with them. X and a horseshoe, Chi-O. Your little life has been fleeting, but you've made more of an impact than most ever will in just a short year. The past year has been a peek inside a story so much bigger than me. A story that is being written in spite of myself. Your tiny little existence has influenced a change in a well-laden path for all generations who will come after you. And to think, you began this change even before you took your first breath. A new life meant that we were no longer the main characters in our self absorbed stories. You gave us a reason to fight, a reason to be better. When you were growing inside of me we learned a whole new way to love. We decided that reverting back to our old, broken ways of doing things was no longer who we would choose to be anymore. No more defaults, only deliberate choices laid ahead for us. Your existence has been the catalyst in a new chapter being written in our lives. One where rebuilding ancient ruins has been accomplished; and your little life, my sweet daughter, was the first stone laid on the path towards restoration. With each passing day I get to wake up and see you here, I see the true power of an all-knowing God. A God who extends love to the broken and grace to the undeserving. Happy Birthday Grace Ann Bullard. One year of you is way more than I deserve. Eleven months old is what you are. That is a big accomplishment. The days of you being here on this Earth in months are getting to be very few. You are about to have a whole year under your belt, sweet girl. One whole year of you! A wise mother once told me; “The days are long, but the years are short.” Now, as your mother, I feel that to be very true. I love you more each minute. Click here to see heart melting shots of sweet Graciebug. These are sooo CUTE!!! Thanks to our awesome photographer, Julie Birdseye, we have some of the most precious pics I have ever seen and I will cherish them for a lifetime. I am amazed at how well she captured the personality and essence of all things Gracie. Tell me what you think! Which one is your favorite? I am so excited about our latest family pics!! Julie Birdseye took them and she is definitely an amazing photographer. It also helps that her subject is the cutest blue eyed beauty in the world!! Here is just a sneak peek and there are many more to come! 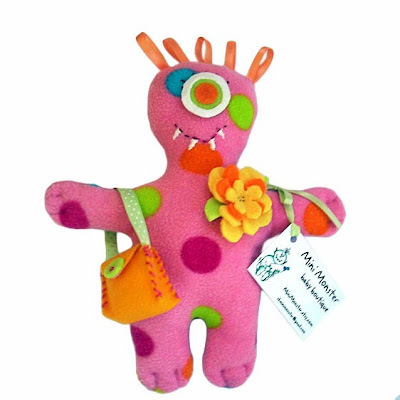 Look at this cute little monster I ordered for Graciebug today on Etsy. She needs a comfort toy for when she misses Mama. I knew this one was perfect right when I spotted it. Maybe it will help through her current clingy stage (fingers crossed), or maybe it will just be as cute as she is. Friday afternoon would mark the end of another week. Inevitably; we loaded up that grey, single cab, Ford pickup truck with everything we would need for the weekend. We would pile inside, always sitting in the same order starting from the driver's seat: Popeye, Taylor, Beka, Nannie. Squeezed in as close as we could be on the leather seat, all we could do was just ride in the couple hours it took to get there. To fill the time we had a soundtrack of eighties and nineties country music playing loudly in the background; as we enjoyed homemade peanut butter crackers and Cokes we had packed for the road. Once we got to town, we would pull over and make the routine stop at the local grocery store. Nannie ran inside to get all the essentials needed for a weekend on the farm, and we would stay in the truck and people watch. Dusk came quickly, and Nannie would emerge with sacks on each arm that would soon be put in the bed of the Ford. Finally, we would drive that last twenty minute stretch down the country road to the big white gate that marked our arrival. This was my favorite part because I would prop my little eight year old self up on Popeye's lap and steer the wheel all the way there. The weekends were packed full of more adventures than a brother and sister could devour. Our days were full of deer hunting, fishing in the tanks, racing our bikes, planting gardens, swimming, diving off the deck into the old fashioned inter tubes, sitting around the fire, swinging in the hammock, and just about anything else we could pack into those short 48 hours. Cowboy boots and swimming suits were pretty much the extent of my wardrobe during the summer days on the farm; and my warmest jacket and toboggan during the winter ones. When each day would come to an end we would all cozy up in that one room cabin to watch whatever show the rabbit ears would allow; yet in my little girl brain I felt like I was at the finest five star resort in Texas. Sunday would come in just the blink of an eye. Around noon, we would load back up again and ride back home the same way we came; sometimes with the addition of a few treasures brought back as proof of the weekend's fun. We would head home towards the Dallas skyline with the East Texas woods in our rear view mirror. I always couldn't wait to get home to tell Mama all we had done that trip, but looking back each weekend at the farm was almost the same. It was a place so wonderful for a little girl whose life at home was often unpredictable. That is how nearly each one of my weekends repeated themselves for years, until adolescence crept in and seemingly more important things took the place of my farm adventures. I sit here now in my grown up body and know that those little girl memories are, quite possibly, some of the sweetest I've got. Are you sure it's been 10 months? There is no way that 10 months have flown by this quickly. At this time last year, I had just started painting your pink walls and measuring the space between each green polka-dot. We set up your crib and made sure everything was perfect for when you would come into our world. I had finally begun to feel like I was past the "I love being pregnant" stage, and I was so ready for you to actually be here. Time was moving very slowly. I really thought your day would never come, and my ribs could take no more of your already strong legs:). I'm not quite in such a hurry anymore, but time has decided to move fast on its own. I really want to push pause, or even go back to when you were brand new. You are like a real little person now, pulling up on everything with those same strong legs and knowing you are the queen in any scene. Sometimes when I try to reach out and grab a memory from just a few months ago, I can't. I am just trying to drink in each second of your smiles, faces, new words and sounds, watching you play, and helping you take steps. Your favorites right now are: falling asleep in your swing, mac and cheese, dancing to music, shaking your head no, mocking other babies when they cry or other people when they cough, looking at books, your little guitar, playing with things you aren't supposed to play with, chewing on your shoes, and your bathtime duckies. Your least right now favorites are: when mama asks you to sign for "more" when I am feeding you (you just pretend like you are too tired and then rub your eyes until I give you more anyway), baby food (now a thing of the past because table food has taken the place of Gerber), and the rocking horse you got for Christmas because it is just scary to you. Sometimes I look at you and wonder how I got so lucky. Who am I to have been blessed with something so wonderful as you? One of my favorites is in the quiet of the night when I go into your room to move you from your swing to your crib. You lay your little head in the crook of my neck, I pray my mommy prayers over your life. I pray that the kingdom of heaven will rain down in your little life. Thank you, Jesus, for my little bug...she is wonderful. It hit me suddenly, like the rush of a forgotten memory finding its way to the forefront of my mind. It was a "something is not right" feeling weighing on my shoulders or, as some would call it, a mother's instinct. I curiously and quietly approached her bedroom door hoping to determine the reason for my suspicion. As a drew closer, the smell immediately reached my nose and it confirmed there had been some foul play on the other side of that sparkling "G". In a small panic I swung the door open to survey the damage; and I saw it everywhere. Her sheets, stuffed animals, pink pajamas, face, hands, and even her crib were all alibis to the morning's events and they had the brown stains to prove it. The culprit was a guilty little girl with a quivering lower lip. The accomplice was a day old, poopy diaper whose remnants were now smeared all over my precious bundle of joy. Unbeknowst to me, the used diaper had been stuffed by an innocent bystander into the top of a very full Diaper Genie in the corner of the room. Coincidentally enough, it was just within arms reach of a determined, chubby hand reaching through the rails of her crib. Once the diaper had been spotted, it was already too late. I have never seen a face look so guilty as her's did that morning. Those blue eyes full of worry told the story of exactly how the stinky situation had transpired. It took me almost a half a day to get the smell out of my nose and lots of soap and bleach to clean up the aftermath, but nothing will ever erase the memory of that morning from my Mommy Rolodex. You are a diva with an attitude that is too cute for words. You have a big personality with big blue eyes to back it up. You are so animated and you love to make silly faces; especially at mama. You love to stick out your tongue and make funny noises, too. Everywhere we go, you know the tricks you can show off that will charm pretty much anyone. You have the ability to captivate every audience. You are scooting around so fast and rolling all over the place. Not to mention that you are pulling up on everything, even the bathtub while you are in it!! You are so active and independent, sometimes I don't even recognize you at all! But, I quickly remember when I walk out of the room for only a minute and I hear your over-dramatic baby cry. This is my simple reminder that you still need your mama. Almost instinctively; I come in, scoop you up, and you grab onto my neck. I look at your sweet baby face and see your three-toothed smile, with no real tears in your baby blues. I hate to admit it, but I just love that you need me that much. You are growing into this strong-willed, funny, tender-hearted, sweet little girl. You have your own likes and dislikes. You have your own opinion and you aren't afraid to share it with others:). I will try my best to let you grow into the person you want to become, with the unique talents God has given you. Daddy says he is proud of the beautiful personality you have started showing us more and more everyday. We couldn't ask for more than being your Mommy and Daddy. The nine months of having you on this Earth have been my favorite. One word I would definitely use to describe this hectic season in my life right now. Example #1: I just got my Christmas tree down, and ladies and gentlemen, its January 20th. Example #2: Taking a shower seems like a luxury and make-up has been on the back burner for a few weeks now. Must I go on? This precious baby girl who is growing so fast in front of me. Some days I hardly even recognize her because she is changing so quickly and growing so big. I don't want to miss anything...not one thing. I want to soak her in, and never forget even a second. I can't wrap my mind around it. People who pour into others' lives without asking anything in return. People who will give, talk, and love the second they meet you; as if they have known you all their lives. There are two who did that for us, and it was enough. Just enough for them to be Jesus with skin on in that very moment. God has seriously shown up in a big way in this department. Knowing that I am truly loved by Him has been very apparent lately. God has given me a place of solace and renewal in this season of change, growth, and chaos. Even on the bad days, it doesn't get any better than that.